HUNTSVILLE, Ala., Dec. 1, 2010 /Christian Newswire/ -- Parents now have the opportunity to channel their children's love of video games into a fun Bible learning and Christian sharing experience. 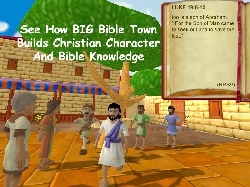 BIG Bible Town is the first online game that teaches God's Word and builds Christian character as K-6 kids practice putting their faith into action. Families can start playing for free at www.BIGBibleTown.com. Designed To Connect With Kids. BIG Bible Town is designed to capitalize on the most popular styles of online gameplay that are propelling the video games market to over $90B by 2015. ** Proof that the online games revolution has reached kids' games is demonstrated by the millions of children that are playing Club Penguin and several other successful online games. According to Bobby Wells, CEO of Third Day Games, "We developed BIG Bible Town to leverage the revolution in online games to benefit millions of families looking for Christian alternatives in today's mostly secular games market. Plus, the growth of broadband Internet allows the company to bypass big box retailers, who have been resistant to Christian game titles in the past." How Does It Work? The objective of the game is to create your own BIG Bible Town homestead, while also building a vibrant, church-centric BIG Bible Town. With their parent's permission, kids first sign up for a free account to customize their game character; begin earning game coins by playing the two free Bible adventures - Noah's Ark and Jesus and Zacchaeus; and using these game coins to purchase virtual items for their homestead. The trailer at www.BIGBibleTown.com shows how the game works. A $5.99 monthly subscription allows kids to unlock three new Bible adventures each month to strengthen their Bible knowledge and earn additional game coins for upgrading their homestead with such designs as the Ark House and the Pyramid House. Members can also donate game coins as virtual tithes and offerings to their game church and then build their downtown by adding a school, hospital, and more. Inviting friends to become neighbors lets them work together to grow their BIG Bible Towns. What Will Kids Learn? BIG Bible Town is designed to use kids' love of games to promote Biblical literacy. Third Day Games has developed over 90 Bible story adventures and will be adding several to BIG Bible Town each month. The game's virtual economy encourages kids to play each Bible adventure several times. Children also learn about missions and tithing and about working together as a church to help their community. The result is a repetitive learning experience that strengthens scriptural knowledge, reinforces Christian principles, and helps build Christian character.